A great pirate time travel. Really good characters and a exciting story the only thing that was distracting from the story was an awful lot of religion and bible quoting. Interesting historical fiction, with a strong and likable heroine. I have to say this was a little/a lot hard to read. There was a good storyline but it was very religous in your face. I have no problem with the religion factor, Its nice to see that people still have that out there but it felt a little too preachy and a little too forced. There is a way to get that point across with out it being shoved down your throat. It was a quick read and entertaining but there were parts and pages that I just had to skip over to keep reading. Exciting book, cover to cover! This was a great pirate story and actually there are 3 books in the series. Great story of love, loss, mystery and adventure! A must read! Loved the story and loved, loved the romance! This book was so wonderful! I enjoyed the characters and the storyline. Love Pirate books! A little preachy, but a good story. The writing is not terrible and it began interestingly enough, but I just could not take it after a while and DNF at about 60%. I didn't particularly care for the characters; the heroine is helpless and whiny and sometimes pretty stupid. I like Christian romances (some of them), but I felt the religious experiences some of the characters had were over the top and they experienced unbelievable changes of heart or sudden faith that did not feel realistic. Maybe that's just me, I don't know. I read this awhile ago. I did enjoy it and read other books in the series. Entertaining and quite fun. 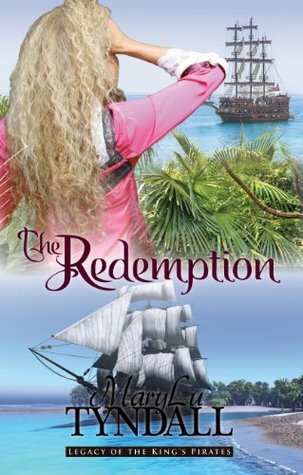 If a bit predictable, "Redemption" had enough twists and adventure to keep this reader engaged. May look into the next book of the series.